Flush-mounted switching actuator for controlling an external gong or other device via the Gira door communication bus. Control of a zero-voltage switching contact (24 V SELV/ 50 µA to 1.6 A AC/DC) via the 2-wire bus. 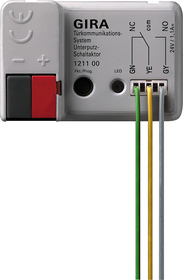 a zero-voltage button (in conjunction with the 2-gang door communication button interface). The flush-mounted switching actuator can be used in four different operating modes: switching, timer/sec., timer/min., and pulse. Impulse function for controlling existing automatic staircase mechanisms. Switching time can be adjusted continuously from 1 to 10 s or 1 to 10 min., depending on the function set. LED display for programming, function selection, and time setting. The flush-mounted switching actuator is intended for installation in a deep device box (60 mm deep) behind a door communication bus coupler.